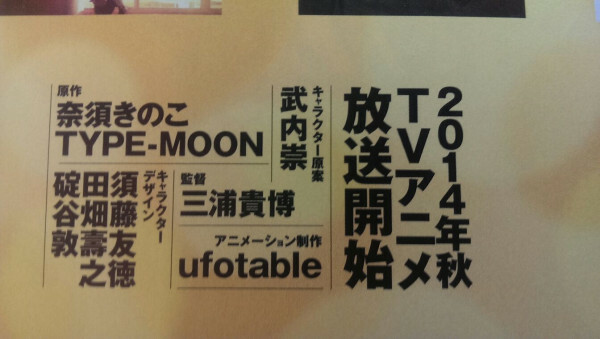 A new anime series based on ufotable’s original Fate/Stay Night series will be released in 2014. The story will not retell or cover old plots and ideas, but will be entirely new. The story will focus on a Grail War that will happen to the usual suspects-families, but a generation later than the original Fate/Stay Night anime. Character designs will be by Kara no Kyoukai’s Tomonori Sudo, Atsushi Ikariya and probably others, too. Directing will be Kara no Kyoukai 6’s Takahiro Miura. The anime is supposedly coming out this autumn season and the voice recording is already en-route. That is so cool, I will definitely watch! I only liked Fate/Zero, so I hope this is less twisted and more fantasy.